Stuffed capsicum in tomato gravy is an interesting and tasty way to include tofu, bean in your diet. 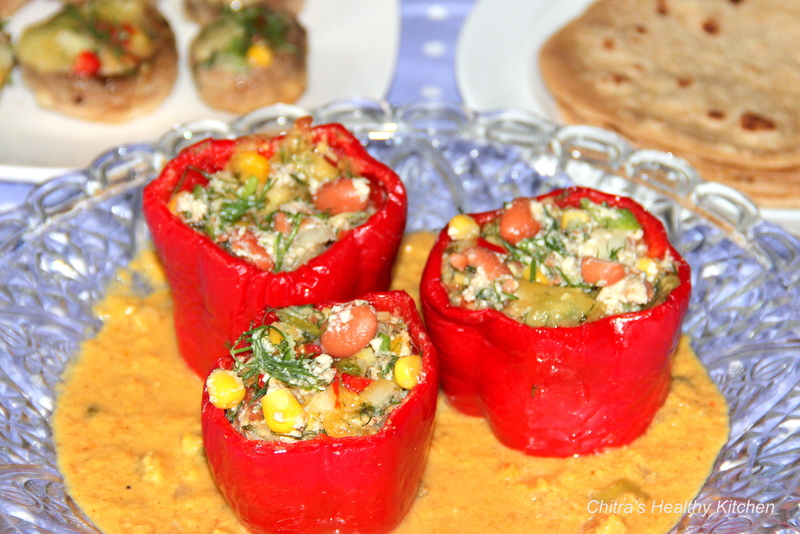 Here capsicums are stuffed with spicy bean, tofu, dill leaves and cooked in the tomato onion gravy. Using dill leaves adds good flavour to the dish. Tofu makes and bean makes it nutritious as they are rich in protein. Research says that including beans and bean products in diet helps in reduction of LDL cholesterol, blood sugar.Tofu supply essential nutrients like calcium and iron. Rose coco beans contains high level of soluble fibre makes them beneficial in reducing cholesterol and blood sugar levels in humans. Pressure cook with 2cups of water and 1/4tsp salt for 4-5whistles. Allow the steam to escape before opening the lid. Mean while drain water from tofu, squeeze a bit between the palms place on the muslin cloth wrap and hang it for 20-30minutes to remove the moisture. Once drained crumble the tofu and set aside. Once the steam comes down drain water from beans and mash it using potato masher. Combine tomatoes, onions, almonds, pumpkin seeds in a food processor/blender and blend them to a smooth paste. Pour this ground paste, ginger-garlic paste in a non-stick pan mix well and cook on a medium high flame for 4-5minutes. Add turmeric, chilli powder, coriander powder, garam masala, salt and cook until the raw flavour goes off. Add coconut milk and bring it to boil and then simmer for 2-3minutes. Turn off the flame and keep the gravy aside. Pre-heat the oven at 200deg C and Line the baking tray with baking sheet and set aside. Rinse and Cut the stem of the capsicum, deseed them. Stuff each capsicum with 1-2tablespoon of stuffing – arrange on the baking tray and bake for 14-18minutes / until tender and cooked. Just before serving arrange the capsicum on a serving dish, pour the hot gravy on top and serve immediately. Tried to make this gravy without using any oil. Oil can be added to coat the capsicum while baking and for making stuffing. Can use single cream instead of coconut milk. Posted on August 1, 2014, in Indian, Side dish, Vegan and tagged Oil free baking appetizers, Oil free baking vegetarian dishes, Oil free recipes, Vegan recipes, Vegan zero oil recipes, Zero oil Indian gravies. Bookmark the permalink. 42 Comments. I’m definitely going to try this! Looks wonderful. Melon seeds – replacement ? Green chili paste ? – this is REALLY hot ? – replacement ? You are welcome and thanks for posing the queries, which helps to me think for an alternative..
Hi Chitra!I have nominated you for an award: “I am Part of the WordPress Family Award.” Congrats my friend! Looks quite good and healthy! Which coco beans are used Chitra? Do you mean Rajma ? This dish looks truly amazing! I would add a bit of chopped avocado for texture and creaminess, thanks so much for the recipe! Thanks Margot. It is my pleasure to be part of FF…Got to meet amazing people like yourself..
What an awesome recipe Chitra! Loved it. So much going on flavor wise and texture wise :). A very nice appetizer/side-dish. Loved the way you made it vegan.